When I announced the first release of the imgflo project in April, it was perhaps difficult to see what exactly it was useful for and why we are developing it. This has changed now as 3 weeks ago we launched The Grid, our AI-based web publishing platform. We are on a bold mission to have “websites build themselves”; because until posting to personal websites becomes easier and more rewarding than posting to social media, content on the web will continue to pile up in closed silos. 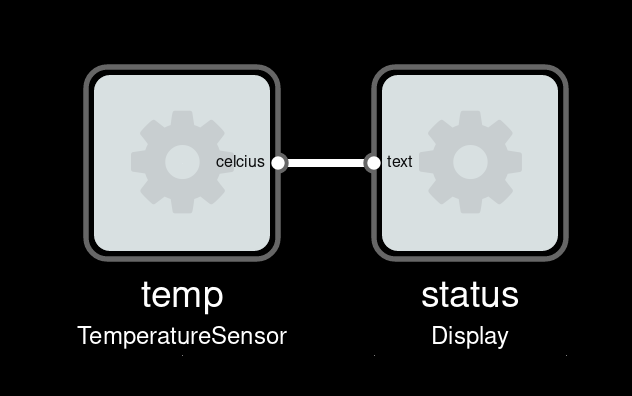 NoFlo: for creating highly testable, component-based, distributed software. Flowhub: for visually and interactively building programs and extensions. And of course imgflo: for on-demand server-side image processing. In total over 100k lines of code, and around 5000 commits over the last 12 months. Some of the stack is expained in more detail in a recent interview with Libre Graphics World. thegrid.io launch site is of course built with The Grid. In the particular layout filter used, the look & feel is driven largely by the content. Colors for text captions are extracted from tweets and social media posts, and the featured images are largely unfiltered. 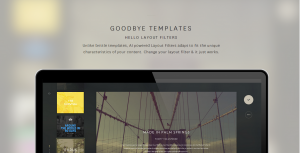 Other Grid layout filters may style all provided content, including images, towards a uniform look specified by a color scheme. Or a layout filter may mix-and-match content- versus style-driven design. It is important to note that no-one chose this exact image to be used in the particular layout section (and thus have the given image filter applied), which is why processing happens on-demand. The layout section with image inside a computer screen is available for content which has images of type “screenshot”. This property may be automatically detected by our image analytics pipeline, or manually annotated by user. The system allows describing many other such constraints, which are all taken into account when it works to create the appropriate layout for given content. Even without considering styling, imgflo has a couple of important roles on a Grid site. Important is the ability create multiple scaled down versions to optimize download size. For this we also created a helper library called RIG, which is used to generate a set of CSS media-queries with imgflo request urls. Processing images through imgflo also means that they are cached. So if the original image becomes unavailable, the website still has versions it can use. This can happen for instance on Twitter when people change their profile picture. Note that while we optimize images when presented on site, we don’t touch the original image (non-destructive). 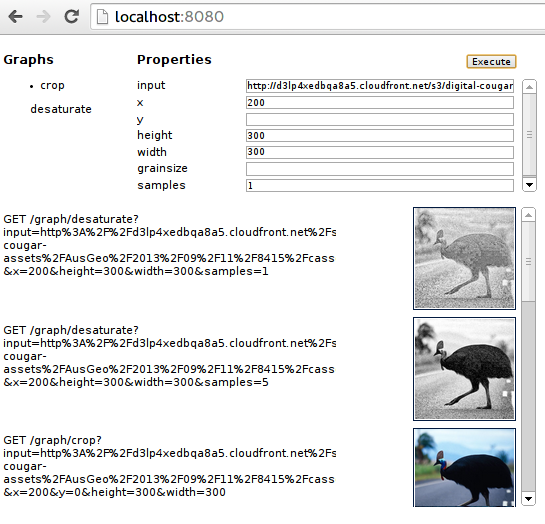 This means image uploaded to The Grid has the full data & metadata preserved, unlike on some other social/web services. However, we are currently not preserving metadata in processed images. 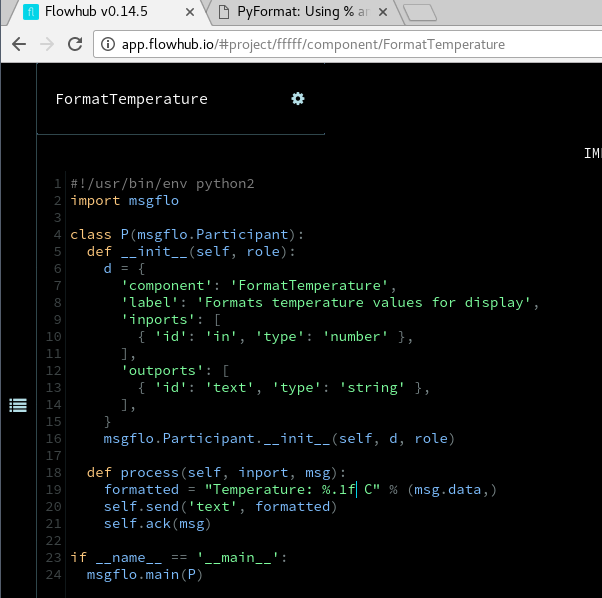 imgflo is now split into three repositories, the GEGL-based Flowhub runtime, the HTTP API server and the native dependencies. The runtime itself is plain C with glib, and could be used in non-web applications for desktop, mobile or embedded. A major feature is that processing requests can now be authenticated, so that non-legitimate users cannot disrupt legitimate ones by overloading the server. We also use Amazon S3 for caching processed images, offloading a large portion of the work. Servicing 10k++ visits a day with a 2-dyno Heroko app has been no problem with this setup. Full details about the changes can be found in the changelogs: server, runtime. 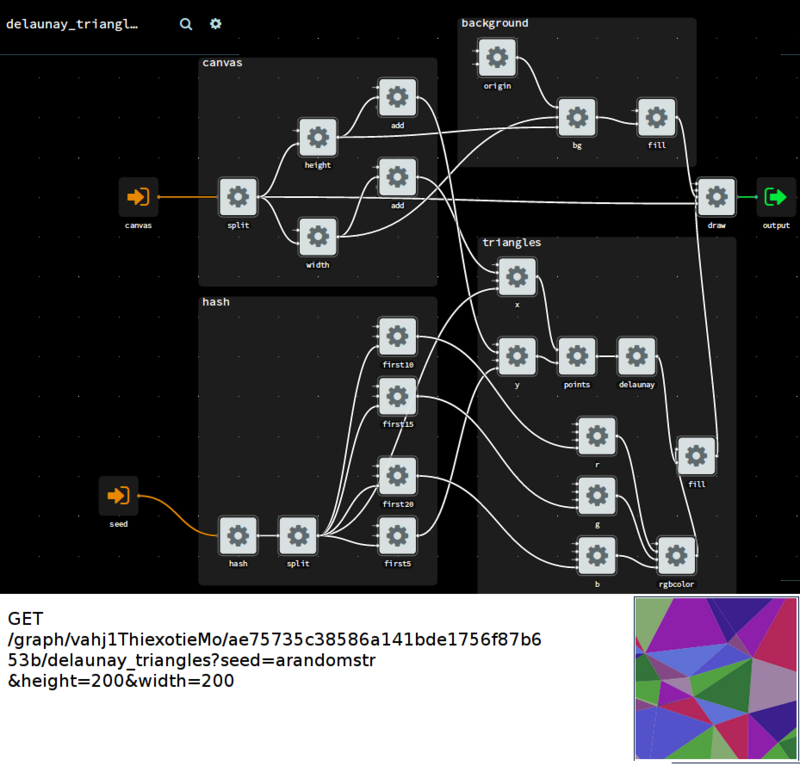 Flowhub provides imgflo a node-based visual & interactive IDE for developing new image filters for The Grid. It is similar to etablished tools like FilterForge, the Blender compositor, vvvv and nuke – which many designers and visual artists are familiar with. However there are still many snags in the workflow for non-technical people. Smoothing out these is major part of the next imgflo milestone. After that the focus will be on horizontal scalability, to handle the load as The Grid enters beta and opens to founding members in spring. At TheGrid we are in need for a flexible service for doing server-side image processing. So after some discussion at LGM in Leipzig, I started writing one based on GEGL, the image processing library that will power the upcoming GIMP 2.10 release. 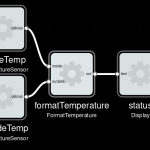 The library provides a demand-driven graph-based API , with a ton of operations included and support for GPU processing using OpenCL. 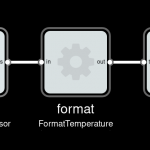 For creating image processing pipelines for the server, imgflo acts as a runtime for Flowhub, our open source visual programming IDE. 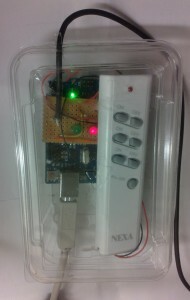 It adds to the existing NoFlo browser, Node.js and MicroFlo microcontroller runtime targets, all possible thanks to the runtime-agnostic protocol. The preview is live and changes whenever changes are made to the graph. 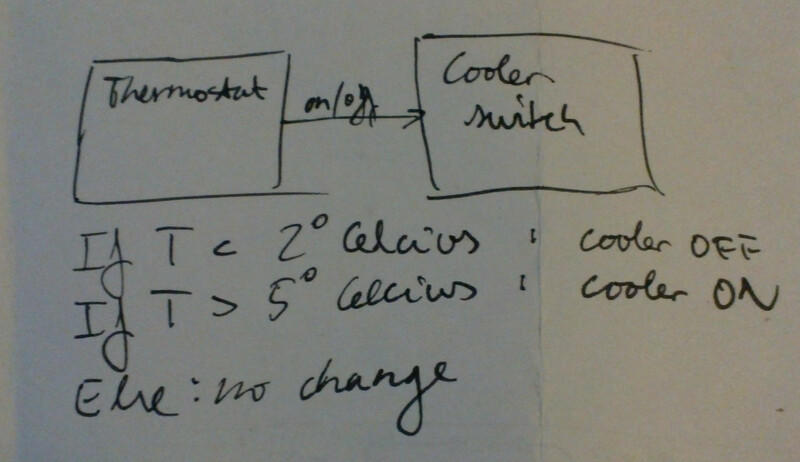 This allows to quickly experiment and develop new graphs. As a server, imgflo provides a simple HTTP API where you specify the input image as an URL, the graph to process it through and any parameters exposed on that graph. Processed images are cached, so that subsequent request on the same url just returns the image out of the cache. The git repository includes configuration and build setup for Heroku, so deploying an instance is a 5 minute job. 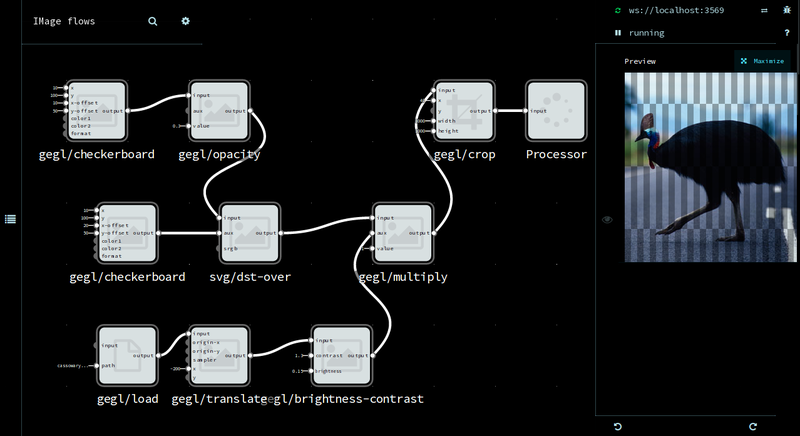 imgflo 0.1 is now minimally useful as image processing server, but there are many more enhancements on the todo list. Scalability and integration with NoFlo are two big topics, as as expanding the pool of available operations and graphs. Porting filters from GIMP to GEGL is a way of helping with the latter. Additionally it would be interesting to provide a way of using imgflo with GIMP. 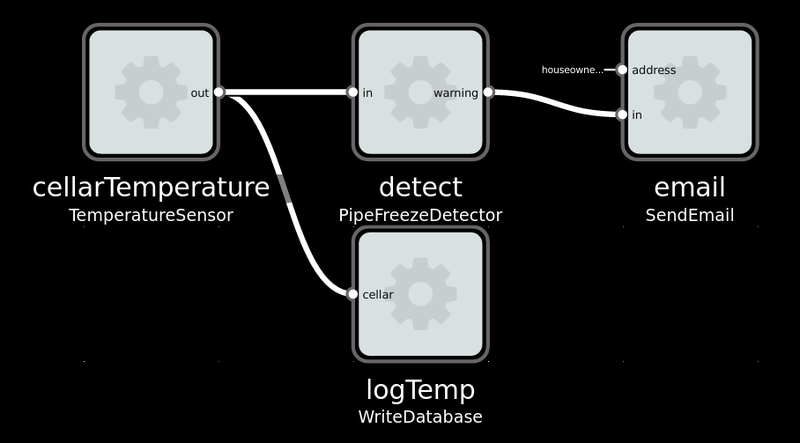 First of all one could use graphs made with Flowhub via GEGL meta-operations. 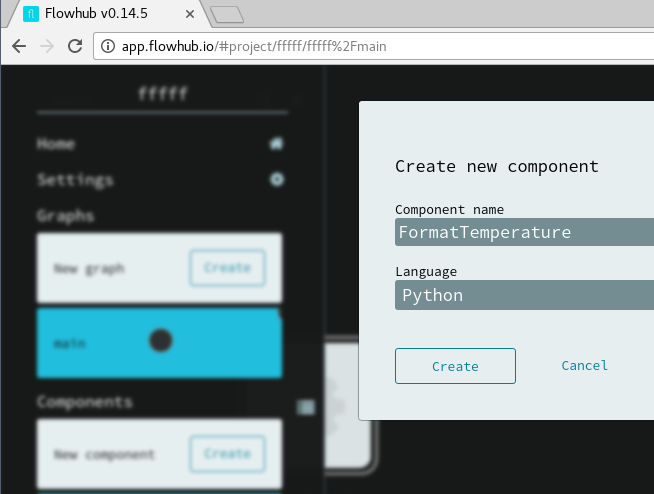 A more crazy idea is to integrate directly, using Flowhub as a companion node-based editor. 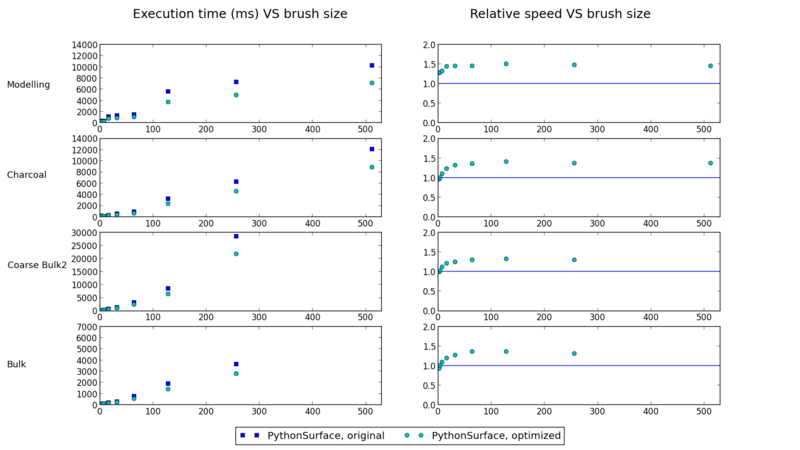 A first set of performance improvements for the brush engine has just landed in MyPaint master. The goals for this work for me were, in priority: a) Making sure that moving to a GEGL backend in MyPaint does not reduce performance, b) Improve performance when integrating the MyPaint brush engine in other applications, and lastly c) Improving the performance in MyPaint itself. TL;DR: * Users of the soon-to-be-released MyPaint 1.1 should experience about 15% faster drawing of strokes for medium to big brushes. * Switching to the GEGL based backed for MyPaint 1.2 is now both feasible and highly desirable from a performance perspective. All dab drawing operations that happen as a result of a motion update event are queued up. When the brush engine has calculated where all dabs should go, tiles are fetched, all dabs drawn and the tiles updated. This in contrast to before where each dab drawing operation would fetch and update tiles. The tiles to be processed are divided evenly between processing threads (one per core). Each tile is processed completely independent of other tiles, so there is no locking or synchronization in the drawing code. The tile backing store must naturally be thread-safe and may ensure this using locks. Within each tile we attempt to make use of auto-vectorization to create the brush dab mask and do the composition of the dab onto the tile. Currently this is only implemented for a part of the mask calculation. Details of the results and how they can be reproduced is found in the original email thread. Starting with the lowest priority goal, but the most relevant to users; performance impact on MyPaint right now. In terms of raw speed of drawing brushes to onto the underlying surface, speedups range from 20% to 50% for larger brushes (16 px+). This sets an upper boundary for the speedup perceived by the user. Looking at the UI-enabled benchmarks of MyPaint, which is doing everything a normal application instance does, including layer compositing and rendering to screen, around 15% speedup was observed. As the UI benchmark only tests a single brush at size=8.0px, it is possible that larger brushes will a higher speedup. Users of the soon-to-be-released MyPaint 1.1 should experience about 15% faster drawing of strokes for medium to big brushes. Note that the backend in use does not make use of the multi-threading introduced by (2) due to the tile store not being thread-safe and that it already had a cache to mitigate the problem fixed by (1). Surface drawing results, GEGL versus Python-based surface. Test results by Till Hartmann on his Phenom II X6. So in terms of raw surface rendering speed, the GEGL based backend is now significantly faster than the Python-based one. 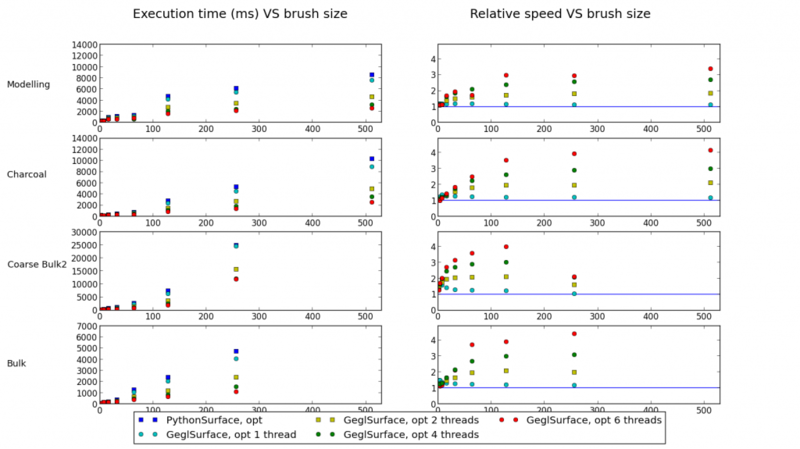 With 1 and 2 threads it is respectively up to 25% and 100% faster for big brush sizes. With 6 threads, it can be up to 4 times faster. Switching to the GEGL based backed for MyPaint 1.2 is now both feasible and highly desirable from a performance perspective. Note that to see UI performance increases approaching the raw surface drawing performance increase we may also need to do the layer compositing multi-threaded. I’m trying to convince the Krita guys to update to the new version and to provide some feedback on the impact. Other consumers of the MyPaint brush engine do not tend to communicate much with us (some are proprietary). I have strong hopes that (1) should increase their performance radically as their tile get/set cost is significantly higher than in the MyPaint case: They need to convert between the internal Krita and the MyPaint brush engine working colorspace each time. They may also be able to enable multi-threading and see speedups similar to the GEGL-based backend as a result. This is only lays the groundwork of better optimized MyPaint brush engine, many areas have room for improvement. For one only a small subset of the heavy code is vectorized. There may be inner loops that can be tweaked. It may be that, with a different tile access pattern compared to before, a different tile size would be more ideal. Perhaps doing the expensive calculation of the brush dab could be avoided some times by caching them… Thinking bigger, one could move all the drawing (and rendering) to the GPU. More details on these ideas can be found here. If you are interested in working on any of it, get in touch and start hacking!